So, the thing about knitting lots of shawls is, you end up with lots of shawls. Sure, you can give some away. But if you (like me) tend to make shawls requiring occasional handwashing and fidgety blocking, it's a little like giving someone a pet: it comes with an implied obligation, so you don't want to impose a handknitted shawl on just anyone. Here's my favorite way to store all those fabulous shawls. It's part of the elfa brand modular closet system sold by The Container Store. This piece is actually marketed as a pants rack, but I have a lot more shawls than pants. There are little clear rubber rings on each metal bar that help keep the shawls from sliding off. And look! 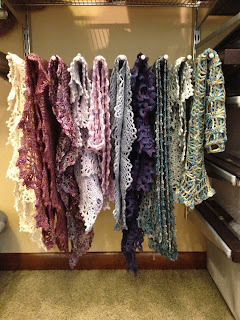 The rack slides out, so it's easy to hang and retrieve shawls neatly from the top, without disturbing their neighbors. As you can see, this rack is full. And what you can't see is that there are more shawls folded on the shelf above the rack. It's definitely time to order a second rack. Pants are overrated, anyhow. In many academic fields, when one is starting to investigate a research topic, the literature survey is an essential stage. It involves hunting down journal papers related to the topic, reading or skimming them for important results, and studying any potentially-useful techniques the author has developed. A researcher who doesn't do this thoroughly risks the frustration of having a paper rejected because her results were already published by someone else, or because a known technique would make her results trivial. Basically, you have to become really familiar with what's been done before in order to confidently contribute something valuable and original. 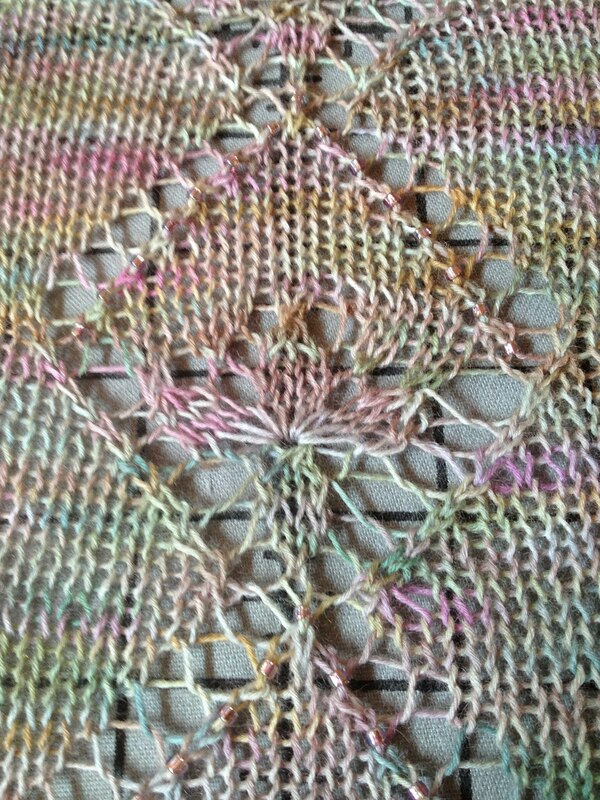 For the last several weeks, I've been doing something similar with knitted shawls. 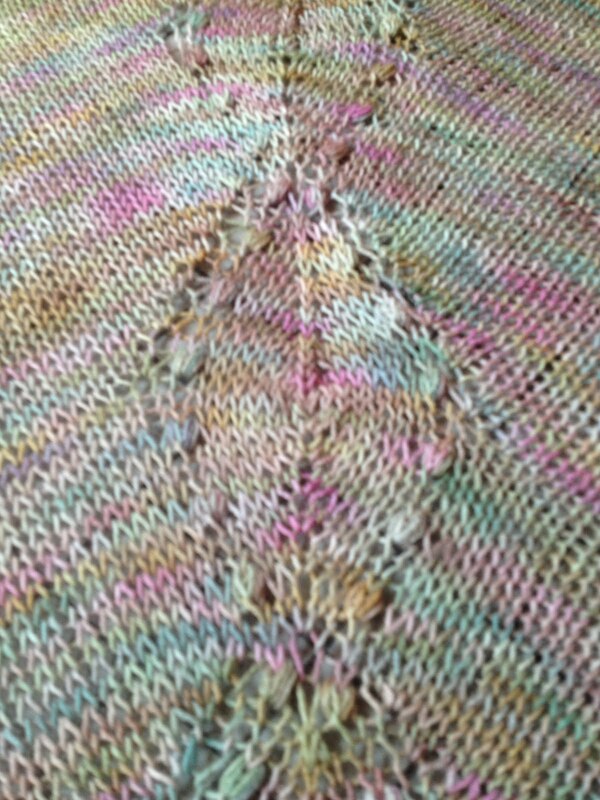 I got it in my head that I'd like to design some knitted shawls and shawlettes, but I've made (read: finished) surprisingly few of them, notably Haruni, Traveling Woman, and Sunbird. I'd already done a good job of filling my Ravelry favorites with interesting candidates, but I hadn't studied how they were constructed, or how the stitch patterns interacted. The three-triangular-panel construction gives better front converage than the common triangle or semi-circular shapes, yet doesn't overpower a short person like a long triangle can. 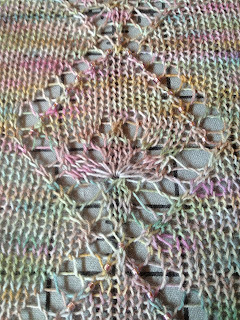 I also tried a beading method I hadn't previously used, at least not with success (there's an Evenstar shawl shoved in a bag in my nightstand, with only the beaded edging unworked). Be warned: the Clover steel crochet hooks with the comfy handles are sized much differently than the Susan Bates hooks. The Clover size 13/14 I had on hand was .50 mm, compared to the .75 mm Bates size 14. Beading went a lot better once I got the correct-size hook for my size 8 beads. Beads are notoriously hard to photograph, and I like subtle combinations of beads with yarn, but you can probably make them out along the upper edges of the diamonds. 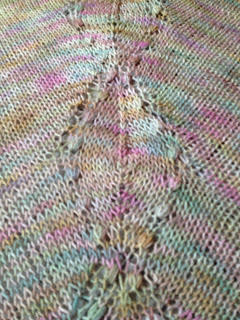 They sparkle when the shawl moves, and they make those otherwise-interminable purl rows more interesting to work. The center of the flower at the bottom of the diamond, by the way, is created with a 3-to-7 increase. That wasn't a new technique to me, but it's a favorite (I used something similar in the flowers on my Betony socks). I also worked my first-ever nupps (pronounced "noop!s"; the exclamation point is optional). They're the little knobs outlining this leaf motif. If you're unfamiliar with these, they're made by working (k1, yo) a lot of times into the same stitch and ending with a final k1; then all strands are purled together on the following row. For the love of all that's holey, do not attempt these without needles with sharp, long tips! So if anybody asks, it's not recreational knitting, it's a literature survey.